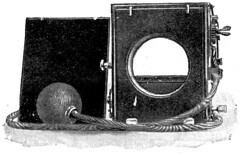 The shutter of a camera or of the lens/shutter unit for a camera isolates the film in the camera from light until the shutter will be released. Depending on the shutter type releasing the shutter means to open it for a moment like a diaphragm, like a roller blind, or simply like a sliding door. A wind-up mechanism or a little electric servo delivers the shutter movement energy and controls the time of film enlightening. except the rotary shutter in the middle - both patented by Lancaster. A rouleau shutter or roller blind shutter has a mechanism to move one or two roller blinds in a preselected speed so that light can path trough its opening for a moment. Some of the first rouleau shutters were offered as accessory for studio camera lenses. 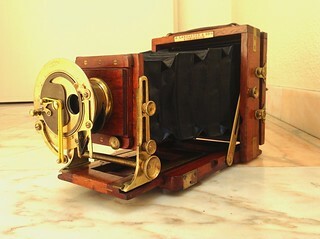 Focal plane shutter means that the shutter is located near the film plane. Most focal plane shutters are of the roller blind type, as light-tight roller blind over the rectangular window over the film plane, with a second roller blind closing the shutter window immediately when the other blind is opened or just opening. Fast shutter speeds are achieved by letting the light in through a narrow gap between the opening and the closing roller blind. In some cameras the diaphragm of the leaf shutter and the diaphragm that defines the aperture for the exposure are identical. Then the opened shutter blades border a polygonal hole with the chosen aperture as diameter. Fast speeds can be achieved by limiting the aperture range for the fast speeds to small and that of the slow speeds to larger apertures. But in most cases there are two diaphragms behind a camera lens or between its optical elements. Then the shutter diaphragm has less but faster leaves which open a hole of maximal aperture size while the second diaphragm, the iris diaphragm, borders the selected aperture. Imagine a sliding door opening, vanishing in one side of the doorframe, and shutting again by reappearing from the opposite side. Sometimes such simple shutter constructions are called guillotine shutter since early variants were simple gravity-driven constructions. Cheap box cameras are often equipped with a simple rotary shutter. It consists of a release lever, a spring, a round tin slice with a hole and a rotation lock lever. 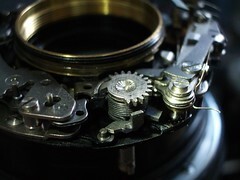 When the release lever is used the spring causes the slice rotating once so that the hole in it passes the camera aperture. In this moment the light enters for an instant, except when the rotation locking lever was used before. Then the hole stays in front of the aperture hole until the shutter release lever is let loose. A spring that drives the curtain is released mechanically by the shutter release button, and the timing of the curtain is controlled mechanically. A spring is released mechanically from the shutter release button that drives the curtain, and the timing of the curtain is controlled electronically. A spring is released electromagnetically from the shutter release button, which is really a switch, and naturally the curtain timing is controlled electronically. Electromagnetics drive the curtain and are triggered by the shutter release button. 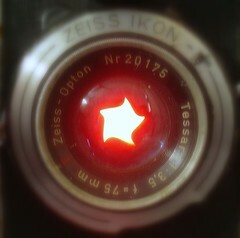 Here "shutter release button" is a misnomer since in this case it is simply a switch for a horizontal motor. This page was last edited on 12 July 2015, at 21:54.